A great deal of my prior life was spent in the publishing and marketing business. I was obsessed with quantifying business results: which tactics worked best to move the sales needle: advertising (print or digital? ), public relations, social media, email, sponsorships or events (spoiler: it’s a thoughtful combination of all of the above). As I was easing back into flying, I became intrigued with the question: Why do businesses use private aviation (either ownership or charter), and, what is the empirical data that proves its worth? My folks have always lived comfortably, albeit humbly. Recently, they joined six others on a private plane for a day trip to a casino in Mississippi. I was hoping that looking through all of the pictures I took at the 2017 NBAA (National Business Aircraft Association) convention, in Vegas, would remind me of what I thought were the most important takeaways. It’s the twilight for General Electric’s flight department. 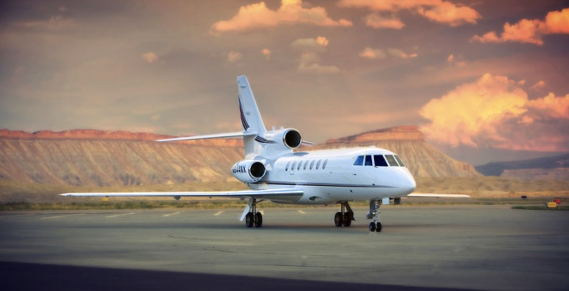 After operating its own aircraft for nearly 75 years, GE has shuttered operations of its three Bombardier Challenger 605s in favor of flying charter. Equally efficient, and, at a fraction of the cost of operating planes, more companies are turning to charter. Seems you can’t walk through a busy airline terminal without seeing at least one “Delayed for Maintenance” notice on a boarding gate sign. It happens. Planes are incredibly complex machines that have to be in near-perfect working conditions before they can take off (each plane has a Minimum Equipment List, MEL, that allows for certain items to be inoperative, yet still allow the plane to fly). The airlines typically stock replacement parts at all major cities, along with having the mechanics on-call to make the repair. Unless the item is not at base, or the repair will take an extended period of time, the flight will be delayed, but will eventually take off. I’ve been an airplane geek since I was in 6 th grade at Lovett Elementary School, reading books on WWII fighter planes in the library. I grew up in aviation at Houston Hobby airport in the early 80’s. At the time, there were only a few series of private jets – Jetstars, Sabres, Lears, Gulfstreams and Falcons seemed to rule. I loved the nimble-looking, French-built Falcon 10 and it’s bigger sister the 20. In 1980 things changed. The Falcon 50 came out and I was in love (26 years later, I finally flew on a 50 from Loreto Bay, Mexico to DFW – I was beside myself). This was as beautiful as the prior Falcons but had three engines – causing quite a roar in the industry. It’s power allowed it to take off from high and hot airports (a challenge that I’ll get into in another article) and had the safety factor of the third engine (jet engines tend not to quite these days, but early on it was comforting to know you had one extra, and with the 50, now, two engines to take over if one crapped out). The 50 typically sat nine, and then the stretch model of the 900 came out six years later, having 12 spots for tushies and several hundred more miles of range. In 1995 the Falcon 2000 was birthed, a humble 10 seater with less than 3,000 mile range. This was the first private jet I flew on – a nice long weekend trip to NY, and it took my breath away. A beautiful airplane, even though it lacked the awe of the tri-jet. In 2007 the large cabin 7x shattered distance records of prior Falcons – 5,490 miles – think NY to the Middle East. The 50, 900 and 2000 could travel 3,220, 4,800 and 3,970 miles, respectively. Check out this great video of a 7X performing at the Reno Air Races – I wasn't shooting the video, but I was there, watching. If our story on Aspen inspired you (Jun 23), grab your family, or, some couples, and take off. The pricing shown is simply a primer and do not include taxes. They are very real numbers, however, there are many factors that affect pricing, namely, actual passenger count, amount and size of luggage and the number of days at the destination. Final pricing will include taxes and any extra fees that may apply, for example, special landing or hanger fees, extra flight time due to air traffic or weather delays, de-icing, catering or special requests. We’re Texas-based, so it’s easy to give sample pricing from Houston or Dallas. If you live in a different city, reach out to us and we can provide pricing from your hometown. Under-the-radar heiresses. Hollywood types. International swells. Southern millionaires. One of the few places in the country where the aforementioned mix is Alys Beach, a small town on the white-beached Florida panhandle near the chic Rosemary Beach community. Here, these top-tier types are neighbors, with private houses built in a mandatory Bermuda style that oozes, in the most subtle way, moneyed beauty. At Alys, a majority of the manses are custom-built with prices starting in the low millions. And while homeowners are allowed to select their own design team — noted architects Robert Orr, Gary Justiss and Bobby McAlpine have designed homes here — every detail must be approved by Erik Vogt and Marieanne Khoury-Vogt, the husband-wife urban planners and architects who conceptualized the community’s design and layout in 2003. Inside info for future residents: Your house must include a courtyard with a fountain, similar to those found in Antigua and Guatemala, and the exterior must be finished with a three-coat, hand-troweled stucco and mineral-based paints similar to what was used in some of Europe’s most storied masonry buildings. Among the current residences, scarce few are available for rent, so there’s a sense of privacy and laid-back, beach-town casualness. There is Charlie’s Donut Truck, where homemade pastries and coffee are served from early morning until they sell out. The neighboring Piper’s Kitchen serves beach fare, from fish tacos to burgers. And for dinner, there is the charming George’s, which offers fine, fresh seafood in a beachy setting, and Caliza, a scene-y poolside spot. Pale blue beach cruisers are the go-to mode of transport — few of the Bentleys and Range Rovers leave their parking spots. Early morning, the quaint Fonville Press is packed — if not for its zippy lattes then for its expansive patio. The property’s first bar, Neat, recently opened, serving classic libations. Once you open your summerhouse at Alys, there is absolutely no reason to leave. This story first appeared on PaperCityMag.com. For more from contributor, ChristinaGeyer, click here. Fly into Northwest Florida Beaches International (KECP), for stays in Alys or Rosemary Beach and environs. For stays in Seaside and points west, Destin Executive (KDTS) works. There are always a lot of planes in the area of DTS, and Eglin approach control does a great job separating most traffic. Be ready for your pilot to have to make some awkward course alterations on the approach to accommodate traffic flow and planes that appear out of no where, it happens, don't be scared. Like to Fish? Learn to Fly. There's been a lot of coverage in the recent years about the pilot shortage - it is real today, and, is only getting worse. It's a wicked blend of the major airlines stealing pilots from the regional airlines, low salaries that don't exactly attract people to the field (this is changing rapidly as airlines and other operators have really upped the pay lately), the Air Force producing less pilots, and generally, the large expense of training it takes to get to the point of being marketable - to name a few reasons. I could not think of better profession, especially if you are interested in travel (not to mention: the mental challenge, flexibility in hours, etc.). I love criss-crossing the country and laying over in random places. I have toured the wine country, spent time with family in SoCal, hung out with friends in Miami, had great Indian food in Queens and partied with some dysfunctional people in Hutchinson, KS (it was them, Marc, not us!). And, while I don't spend a lot of time fishing when at home, I enjoy it, and fishing seems to find me while on the road. It often starts out of the blue: I once had to find a hotel out towards Park City because a convention at our destination of Salt Lake City left no hotels in town. While driving through the beautiful country side and crossing a bridge over the Provo River, my co-captain/buddy Guerrero spotted some guys fly fishing and yelled, "I want to do that!". Any avid angler would benefit from taking up flying - it could take you to countless lakes, rivers and oceans, and, you'd get paid to be there! Nestled in between the Santa Ynez Mountains and the Pacific Ocean, Santa Barbara is much like our very own American riviera — with its red-tiled roofs and Spanish architecture, aromas of salty air, rows of tall palm trees, and cool breezes that flow from the mountains. My home away from home is San Ysidro Ranch, the luxurious, idyllic resort located in the Montecito foothills only two miles from the ocean. The ranch is home to 40 cottages that make guests feel like they have a private residence in the picturesque neighborhood of Montecito, an enclave of Santa Barbara. Each cottage is decorated with one-of-a-kind antiques, offers Bulgari bath products, and overflows with history. After all, Jackie O and John F. Kennedy honeymooned here. The driveway off San Ysidro Road is flanked with rows of lavender and olive trees, a popular backdrop for engagement and bridal photos. Guest reception is located in the Hacienda, a freestanding cottage covered in Instagram-worthy bougainvillea. Guests are offered fresh baked cookies and refreshing lemonade from the property’s lemon trees. The gracious bellmen lead the way in a golf cart to your individual hideaway — a personal oasis, branded with your last name. If our story on Santa Barbara inspired you, grab the gals, or, some couples, and take off.